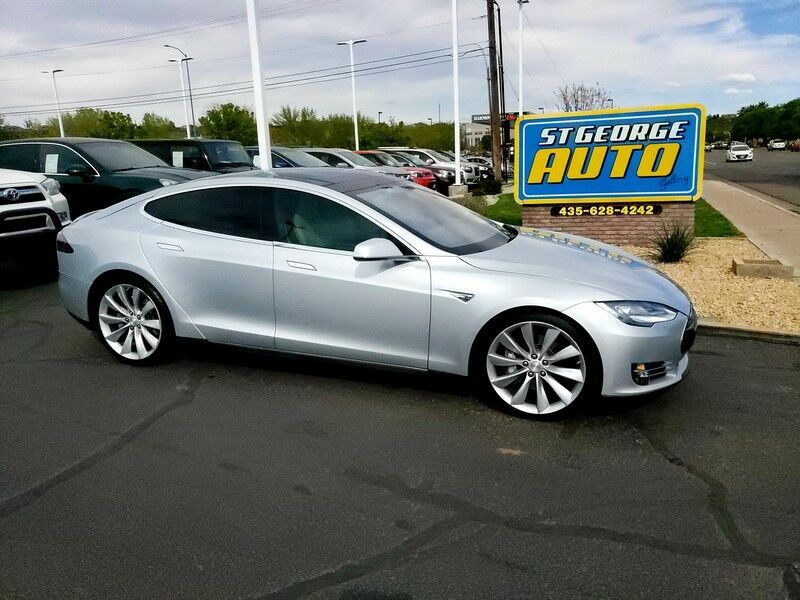 ST. GEORGE AUTO has a wide selection of exceptional pre-owned vehicles to choose from, including this 2012 Tesla Model S. Is it possible to fall in love with a vehicle? It is when your vehicle is as prestige as the Tesla Model S. Exceptional in every sense of the word, this incredibly low mileage vehicle is one of a kind. This is the one. Just what you've been looking for. The 2012 Tesla Model S delivers extraordinary range for an electric car, along with excellent power efficiency and tremendous acceleration. A 3G data connection powers Google Maps for navigation and Internet radio. The 17-inch touch screen reacts promptly to input. The resulting sedan takes more from premium European styling than stodgy American or Japanese automotive design. The Model S looks like a modern grand tourer, its curving roof line ending up in a hatchback over the rear while rounded fenders pontoon prominently from the sides. The Model S' accelerator pedal serves as a direct line to the car's power. The merest touch resulted in immediate response, and in this Performance-trim car, which Tesla says can hit 60 mph in just 4.4 seconds, a full push to the floor will kick you back in the seat and delivered a push like a freight train. Other cars may boast more than the Model S' 443 pound-feet of torque, but none of them bring it on at zero rpm. Accelerating the Model S is an amazing feeling. The car's traction control system necessarily arrested the acceleration a slight bit, preventing the 21-inch high-performance Continental tires from shredding themselves all over the road. However, the car's 4,647 pounds also contribute significantly to keeping it from getting out of control under heavy acceleration. If you are in the market for a stylish luxury sports car, you will never need to fill up with petrol, look no further than this amazing Tesla Model S!!! Call or Come in today to Scheduled your discovery drive!!!! !